elock has designed a completely new lock systems to make your life and work with key systems safer, easier, more convenient and economical. 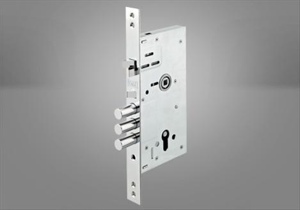 We have replaced the traditional mechanical locking media through digital technology and access control features. Sensationally simple and elegant is the contact free operation as with the transponder card and sets new standards for the Hotel lock Systems. 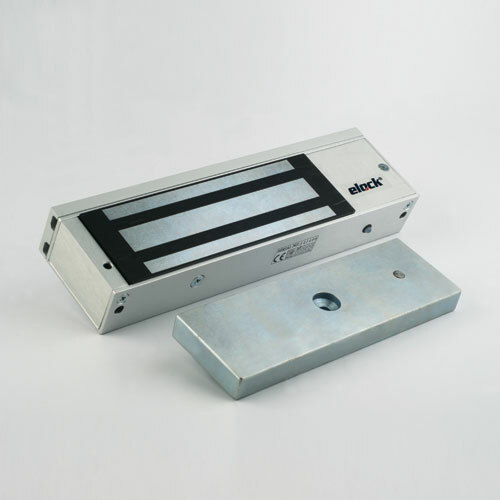 The easiest handling for each guest, old or young, is a main requirement of a ELOCK2 System.This provides only the RFID Transponder Technology. The costs of this high technology compared to conventional magnetic card systems are just slightly more expensive. Easy handling for your guest as high-light. Operating the lock is as easy as can be. All you do is tap the transponder card against the but-ton for a moment with an authorised transponder and then turn the handle. The guest simply can open the door.To lock the door you just shut it causing the latch bolt to move safely into the locking posi-tion. This very easy and elegant operation me-ans extreme simplification to your guest. 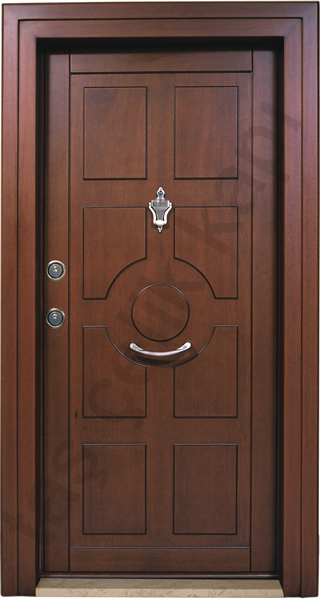 The integrated anti-panic function ensures that the door can be opened from the inside whenever danger threatens. 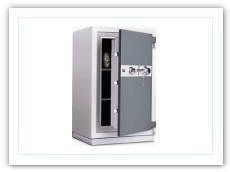 To provide access for visitors or clients and cu-stomers the lock can be programmed in such a way that it can be opened without a transpon-der during predetermined, limited periods of time. This can be done either manually with the help of a transponder that has been programmed to include a permanently-open function or by using time-control software. This brand-new 13,56MHz Transponder Tech-nology has been set as a worldwide ISO (15693) Standard and is used in airports, airlines, and international mail and forwarder organizations. This grants a maximum mass production and protects your investment. 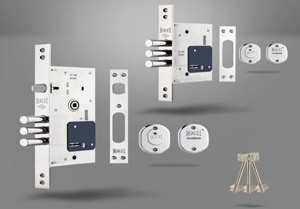 Installation is very easy directly on a Standard door with EURO or DIN-Standard mortise locks. At check-in, your guest gets his uniquely coded transponder card, which contains date and time codes, as well as a departure time. At departure the guest returns the transponder card to the reception. Non-returned cards au-tomatically become invalid upon departure, or upon using a new card at the door. The format of the transponder complies with the ISO15693 standard of International Credit Cards and can be customized by printing the hotel logo or a sponsor advertisement. a) Using the programming device and software all the functions described can be activated. To start up the H8-Terminal it has to be con-nected to the programming device. After that it can be programmed either online or with a transponder. If a transponder is lost you simply programme a replacement transponder. The first time the replacement transponder is used the authorization of the lost transponder is automatically cancelled. Online programming cancels the authorization at once. b) Security Virtual Network (SVN). In combination with online components such as access control the authorization data are re-corded / stored on the transponder. Whenever the transponder is used the latest update of the locking plan is transferred to the transponder. By specifying the period of validity in the soft-ware you can determine at what point in time the authorization expires. Whenever necessary the period of authorization can be prolonged at a networked SVN terminal. In this way offline components can be comfortably linked to the online access control. I am looking for a security entrance door for my apartment (from landing into apartment, not from road into apartment block) and would like to have an idea of price range and availability please. Thanks. We have 3 tip of security doors, we do them mate to measurement. Standard security doors are starting price euros 1400.00, including installation and locks,handle spy hole,etc.just ex vat. And price its go up,the pence on the range of the doors. Installation of the door on place takes 6 to 8 weeks from the date of ordering the door. I am looking for a high security lock with pstent protected profile. That is its keys cannot be copied unless authorised by owner. Do you cater for these please? Good morning dear Borg , Yes we do have no body can bump and no body can copied unless, you want to copied or cancel the key being lost. The systems call ELOCK a German product ,is the best lock in Malta. If you like to know more about the system please visit our shop in San Guwann .